Towards the end of his life Thomas Cole executed a final series of paintings on religious subjects known as The Cross and the World. In it, the artist – a pioneering landscape painter considered the founder of the Hudson River School – depicted a sublime vision of nature that became the vehicle for his quest for salvation and spiritual knowledge. Cross at Sunset is not part of that series but is extremely close to it. It depicts an impressive cross in the foreground, to the left of which and some way away is a bell tower. Behind these two elements a valley recedes into the distance where mountains are outlined against the horizon. The light from the setting sun spreads out like a fan and assumes a fantastical character, establishing a dialogue with the cross in the foreground, which radiates its own light. Drama and theatricality are typical of Cole’s work, which generally aimed for a moralising effect. In addition, the fact that the painting is unfinished makes it possible to see the under-drawing and the orange toned ground that Cole applied in the lower part of the composition. Cross at Sunset has in common with Expulsion. Moon and Firelight the same religious sentiment that emanates from all Thomas Cole’s paintings. Although the artist always advocated direct contemplation of nature as a manner of endowing landscape painting with spiritual and moral substance and cultivated an allegorical style of landscape painting in keeping with the European romantic tradition, his religious fervour grew stronger as the years passed. In 1844, influenced by the Reverend Louis L. Noble, he was baptized by the Episcopalian Church and thereafter the father of American landscape painting decided to devote his work as a painter to the Church and converted his studio into a workshop and oratory. Immersed in an almost monastic solitude interrupted only when he allowed his wife to read to him, during his final years Cole worked on the series he called The Cross and the World. In this set of works, which he left unfinished, their whereabouts mostly unknown, he aimed to express clearly his belief that landscape painting was capable of conveying the deepest moral feelings. Although Cross at Sunset does not belong to this series, 2 it nevertheless reflects the religious zeal of these late paintings. 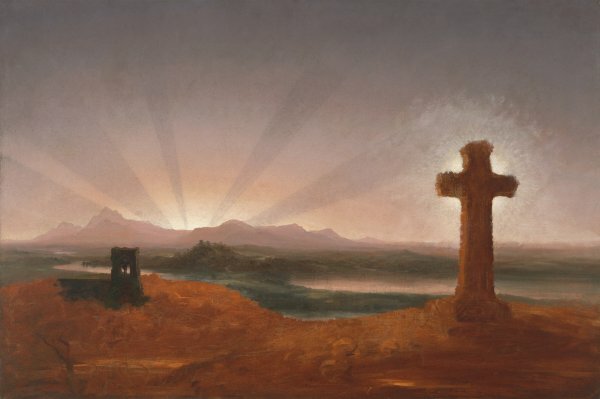 The composition is dominated by the presence of a large cross and in the distance, on the left, silhouetted against an unfinished landscape, rises the belltower of a monastery. 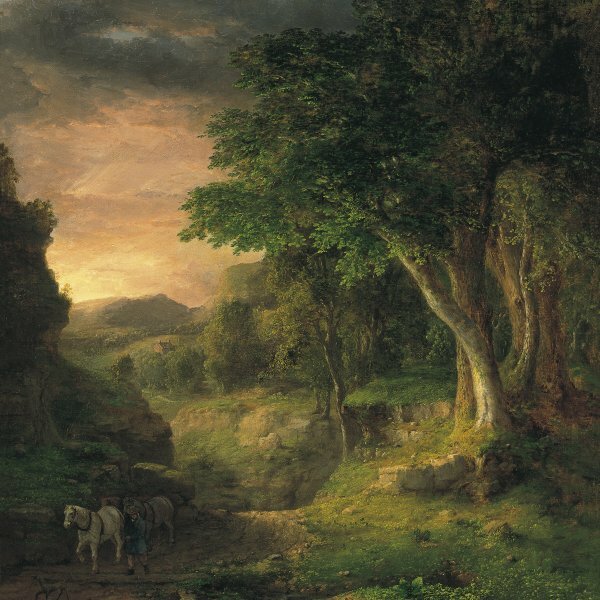 The rays of sun sinking behind the mountains of the horizon are the same ones that appear in another work Cole painted two years earlier, Gothic Ruins and Sunset. Their glow is handled in a symbolic and dramatic way that leaves no doubts as to their relationship with the divine light present at the Creation. The gorgeous light is rolled.